Saint Gregory was a great man of the church who did many things in his life time. He was born in Rome in about 540, his father was a wealthy senator. His mother, Sylvia, is also a Saint. Gregory received an excellent education, he became prefect of the city of Rome. He gave up his political career to become a monk and built seven monasteries. The church called him to be a special deacon, forcing him to enter the public life once more. His writings are of great importance to the church, he is considered a church father and is a Doctor of the church. He was very concerned with bringing the faith to England. During his time, Rome was constantly being overrun with attackers causing him much strife. Finally, Gregory was made pope, even though he didn't want the honor. He organized the church as it had never been before and he structured the liturgy. 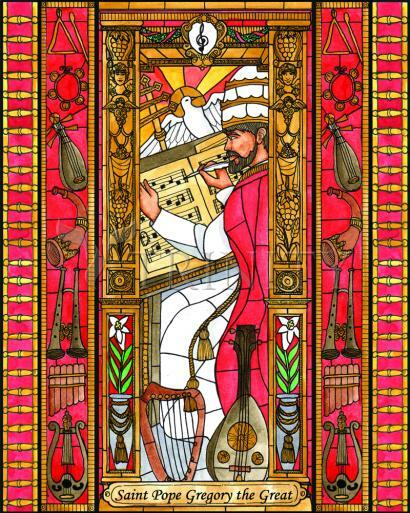 He did so much for church music, composing and organizing the service, that the music became known as Gregorian chant making him a perfect patron for musicians, composers and singers. His feast day is March 12.